Lawmakers on Capitol Hill petitioned the Qatari ambassador on Friday to explain his government’s "expanding diplomatic and economic ties" with Hamas in a letter that highlights the increasingly strained ties between the United States and Qatar. The lawmakers call on Qatar’s ambassador to Washington, Mohammed Bin Abdullah al-Rumaihi, to explain why the oil rich country has pledged to give the Hamas government in the Gaza Strip $400 million, money they fear will go to fund terrorism. "We believe that Qatar’s relationship with Hamas empowers, legitimizes, and bolsters an organization committed to violence and hatred," the 24 House lawmakers from both sides of the aisle wrote to Rumaihi. "In the interest of maintaining strong U.S.-Qatari relations, we urge you to promptly address these serious allegations regarding your relationship with Hamas." Qatar’s financial backing of Hamas is of particular concern to the United States, which views the strategically located Middle Eastern nation as a critical war ally and has provided nearly $500 million to fund military bases there. If Qatar cuts off funding to the financially struggling Hamas, it could shatter the terror group’s government in the Gaza Strip. "I fear that the government of Qatar’s continued support for Hamas may strain our close, strategic relationship with our ally Qatar," said Rep. Peter Roskam (R., Ill), who co-authored the letter with Rep. John Barrow (D., Ga.). "There is no excuse for backing an organization that fires rockets at innocent civilians, orchestrates suicide bombings, and uses their own people as human shields," Roskam said. "I hope that Qatar swiftly addresses these concerns and ultimately forgoes any relations with Hamas." The lawmakers tell Rumaihi that they are "disturbed" and "concerned" over the "apparent spike in diplomatic relations between Qatar and Hamas over the past several years," according to the letter, a copy of which was obtained by the Washington Free Beacon. A Qatari embassy official did not respond to a request for comment about the letter. "Qatar and its new Emir should take this letter very seriously," one senior congressional aide said. "Continuing to support Hamas could quickly sour the general goodwill that exists in Congress towards our bilateral relationship. It’s about time someone take a stand against this unacceptable behavior." "Qatar is a ‘frenemy’," Jonathan Schanzer, a former terrorism finance analyst at the U.S. Treasury Department, said. "They’re an ally on some issues but they are decidedly against us on others." Though Qatar complies with and even aids the U.S. military, it has emerged as the Islamist Muslim Brotherhood’s key funder, according to U.S. intelligence sources. "Qatar is the ATM of the Muslim Brotherhood movement and its associated groups," Schanzer said. "And Hamas is of course a splinter of the Muslim Brotherhood." Qatar provided Egypt with nearly $8 billion in loans after Brotherhood-backed former President Mohamed Morsi came to power, according to U.S. intelligence sources. When Morsi’s government was toppled by the military, key Hamas officials who were residing in Egypt fled to Qatar, according to reports. 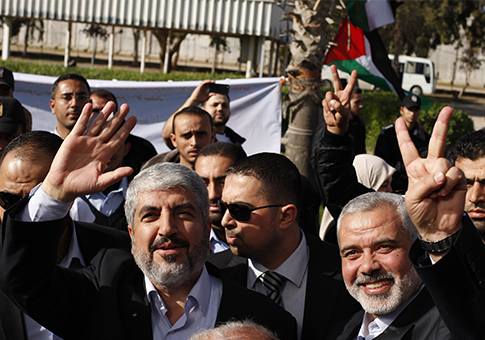 Top Hamas official Khaled Meshal also resides in the country. Qatar’s funding for Hamas has kept the terror outfit afloat as one-time allies like Iran and Egypt pull back, experts say. "This letter is putting pressure on Qatar at exactly the right time," Schanzer said. "The reason is that the Egyptian military is now cracking down on Hamas. They’re destroying the [illicit underground] tunnels, the financial lifeline of Hamas." "If the U.S. could convince Qatar to cut off or drawdown its assistance then this could deliver a harsh blow to Hamas’s financial well being" and even "bankrupt the movement," Schanzer said. Qatar’s cozy relationship with Hamas and the Brotherhood has not stopped the United States from using the country as a central military and intelligence hub. The Al Udeid Air Base located south of Doha "serves as a logistics, command, and basing hub for U.S. operations in Afghanistan and Iraq," according to a 2012 congressional report on Qatar-U.S. relations. From 2003 to 2012, The United States awarded Qatar nearly $500 million in military funds, transforming Al Udeid into one of U.S. Central Command’s most vital assets. As the Qataris capitalize on the U.S.’s military might, they have opened their doors some of the region’s most radical players. "In April 2013, Qatar chartered a private airplane to transport Hamas Prime Minister Ismail Haniyeh along with Yehia Sinwar and Rawhi Mushtaha, considered founders of Hamas’ military wing, to Doha," the lawmakers noted in their letter to the Qatari ambassador. "Sinwar was serving 23 years of the four life sentences he received for his role in Hamas terrorist activities when he was released as part on an agreement to free Gilad Shalit, the Israeli soldier kidnapped by Hamas in 2006," the letter says. In February 2012, Hamas Prime Minister Ismail Haniyeh famously "delivered a Friday sermon at Qatar’s Grand Mosque in which he stated, ‘We are now on the door of the battle to liberate Jerusalem,’" the lawmakers’ letter states. Just one month later, "the Emiri Court of Qatar funded a mass wedding for Palestinian terrorists who were deported to Qatar as part of the Shalit agreement," the lawmakers wrote. Later that year, "Haniyeh told an audience at a conference in Doha that ‘we should decide that the resistance and the gun are the only and real course to regain and purge Jerusalem,’ " according to the letter. "Failure to condemn such brazen incitement undermines our shared interest of regional stability and prospects for a lasting Israeli-Palestinian peace treaty," the lawmakers wrote. This entry was posted in National Security and tagged Congress, Hamas, Middle East, Mohamed Morsi, Muslim Brotherhood. Bookmark the permalink. Adam Kredo is senior writer reporting on national security and foreign policy matters for the Washington Free Beacon. An award-winning political reporter who has broken news from across the globe, Kredo’s work has been featured in the Wall Street Journal, the Weekly Standard, Commentary Magazine, the Drudge Report, and the Jerusalem Post, among many others. His Twitter handle is @Kredo0. His email address is kredo@freebeacon.com.